We are pilots dedicated to providing aviation apps that are simple to use, making flying more safe, fun and affordable. We offer several Android apps. All are free, open source, designed for most Android devices, are ad-free, and require no invasive Permissions. Note that our apps have been thoroughly tested and are used routinely on a vast array of devices, so if you should encounter any problems please contact us on our Forum so that everyone can benefit from awareness of the problem and solutions. 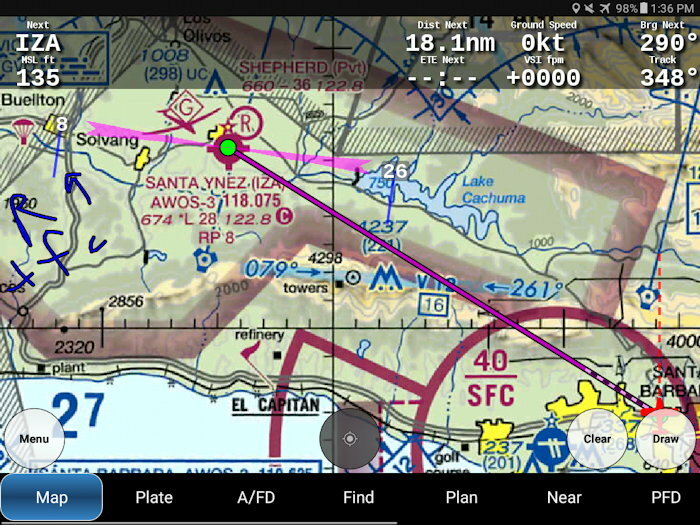 Avare with GPS moving map on all FAA charts, Airport Diagrams and Approach Plates, AF/D, weather & TFRs, Flight Plans and much more. Map screen during ground planning on v7.6.8 2017 with Draw note on Right Traffic indicator for IZA. •To see videos about Avare, please visit our YouTube Channel. •To visit the Google Play store page for Avare where you can learn more, read Reviews, and Install, Click here. 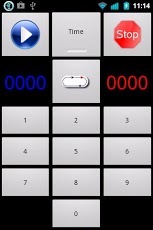 I-Timer, a simple app for IFR pilots that’s also useful for VFR pilots and even as a basic household timer. •To visit the Google Play store page for I-Timer where you can read Reviews and Install, Click here. In-Flight Instruments (I-FI) AI/Heading app. •To visit the Google Play store page for I-FI (In-Flight Instruments) where you can read Reviews and Install, Click here. Avare external I/O plugin app, that provides add-on functionality to Avare. 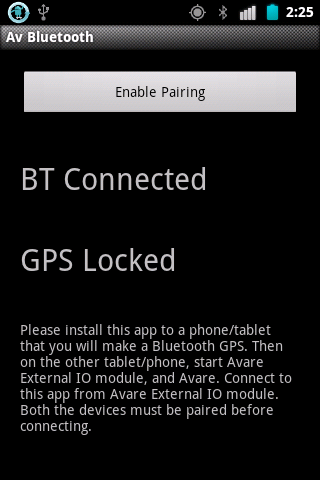 Currently, It allows connecting Avare to external GPS and ADSB units on Bluetooth. Avare users can also connect to the XPlane, and Flightgear Flight Simulators using this add-on. Autopilots can use this module for position updates. See Avare External I/O Help for details. Image showing connection to an external GPS device on Bluetooth. •To visit the Google Play store page for Avare add-on where you can read Reviews and Install, Click here. 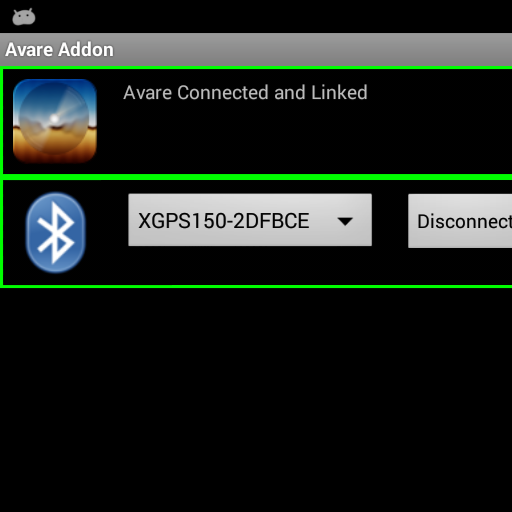 Avare Bluetooth GPS app that converts a second Android device such as a phone into a Bluetooth GPS, so you can place it in the cockpit in an optimum GPS signal location and provide Avare with GPS location on your primary device such as a tablet. •To visit the Google Play store page for Avare Bluetooth GPS, where you can read Reviews and Install, Click here. Chart Sack is GPS app that lets you navigate on any chart of your choice. 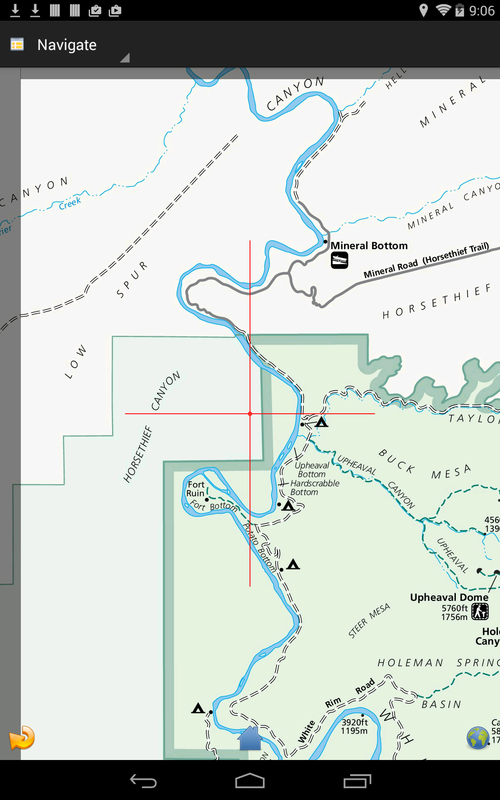 You can download a topographic map from the Internet, scan a paper map from your shelf, or even draw one yourself. The only requirements for the charts are that they are to scale, and are in a JPEG, BMP, GIF, or PNG file format. This is useful any time you want a map (topo chart, trail, park, bike or jogging path, etc.) that will work offline. •To visit the Google Play store page for Chart Sack GPS app, where you can read Reviews and Install, Click here. +Apps – Starting in 2018 Apps4Av is releasing new Android apps useful for anyone but not specifically designed for aviators. To learn more, Click here. We are an all-volunteer group, and we invite you to join us by getting in touch. To save time and better serve all our users, we want to communicate with you via our Forum. Your questions and requests, or tricks and tips you’re willing to share there are very helpful for everyone using our apps. Please contact us via the Forum and we’ll try to respond quickly. If you’re also willing to help us and other users by replying to questions from other users on the Forum, it will help everyone. We also invite you to post photos, tips and tricks, or stories there about how you use our apps. Thanks! Click here to visit the Apps4Av Forum where you’re of course welcome to read anonymously without posting.